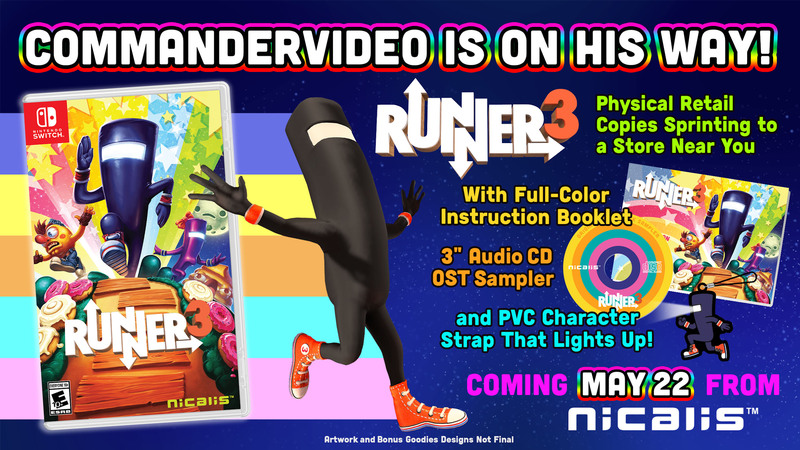 Runner3 will launch for Switch and PC on May 22, publisher Nicalis announced. In North America, the game will be released both digitally via the Nintendo eShop and physically at retailers. The physical edition will include a copy of the game, full-color instruction booklet, three-inch audio CD sampler, and PVC character strap that lights up. It will be available in stores and at online retailers like Amazon, Best Buy, GameStop, and Target. Developed by Choice Provisions, Runner3 follows in the flamboyant footsteps of its predecessors with level after level of auto-running fun. You’ll jump, slide, kick, bounce and boogie your way past enemies and obstacles in an effort to stop the terrible, treacherous, troublemaking Timbletot! Dauntless dashing, however, is only the beginning. As you rush past giant foodstuffs, through haunted amusement parks and across industrial landscapes, you’ll ride creatures and vehicles (including a mine cart, a giant grub and…a flying eggplant!? ), explore branching paths, snag collectibles, earn new outfits and battle quirky bosses. And the courageous commander isn’t alone—CommandgirlVideo gets in on the action too, as do numerous friends, top-secret guest stars and Dave. And let’s not forget the trusty Narrator, Mr. Charles Martinet (who’s best known as the voice actor for a certain Koopa-stomping video-game hero, you know which one we’re talking about). But wait, there’s more! In addition to regular stages and so-tough-your-head-might-explode challenge stages, the game features three worlds’ worth of retro-style platforming levels, complete with boss encounters—if you have the skills to unlock them.